Clay pipes not only have a reduced bedding requirement as compared to flexible pipe materials, but bedding design may incorporate the use of recycled aggregates arising from e.g. construction demolition waste. The papers below provide further detail. The load bearing capacity of any pipeline is dependent upon the inherent strength of the pipes and fittings together with the support provided by the bedding in which the pipe is laid. 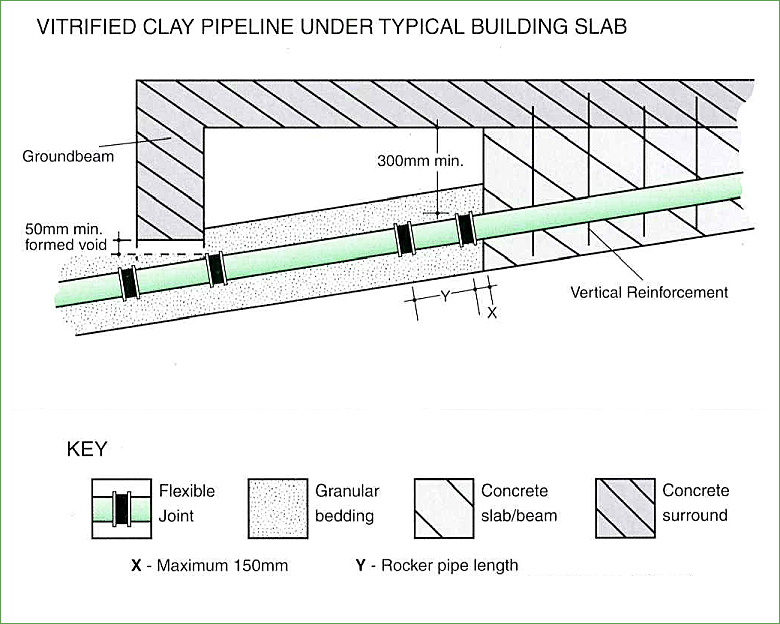 For building drainage these are usually vitrified clay with sleeve joints. These pipes, having very high inherent strength, require little or no bedding material. Clay pipes and fittings can often be laid on the natural trench bottom or with a regulating layer of “as dug” material or inexpensive gravel bed. Such a system can be expected to give a satisfactory performance throughout the design life of the building. In building drainage, PVCu is the most common material. These pipes have little inherent strength and are dependent on substantial bedding for support. 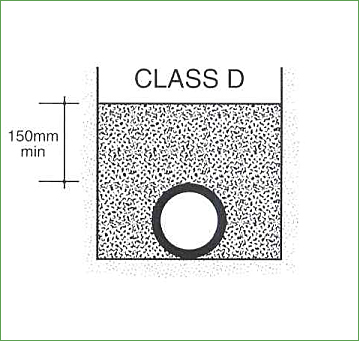 The minimum such requirement is usually 100mm granular bed and pipe surround. The quality and proper placing of the bedding material is of paramount importance and this system therefore relies heavily upon the competence of the site operatives and on good site supervision. The incorrect laying of flexible pipes could result in flattening and ultimate failure. 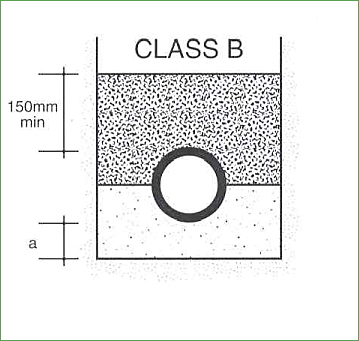 The figures for Crushing Strength and Bending Moment Resistance (B.M.R) in BS EN 295 Part 1 have been established after extensive research into the loads imposed on buried vitrified clay pipelines. The requirements for B.M.R have been set sufficiently high to ensure that pipes conforming to these, and used in a properly constructed pipeline, will not fail in bending before they reach their design crushing load. Testing for B.M.R is only applicable to pipes up to and including DN225 and with normal lengths equal to or greater than 1.1m. With pipes less than 1.1m in length research has shown that the bending moments developed are insufficient to be of concern to the designer. Clay pipes, when used with the appropriate bedding, have the capacity to withstand the full range of trench backfill and surcharge loads that are encountered in all but the most extreme site conditions. 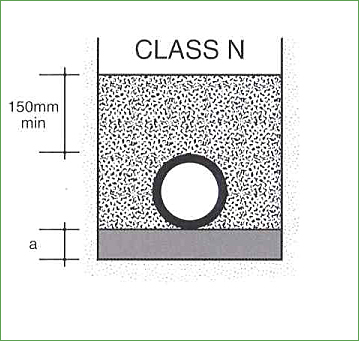 The Crushing Strength and Bending Moment Resistance of vitrified clay pipes are detailed in Manufacturers Product Information Leaflets. 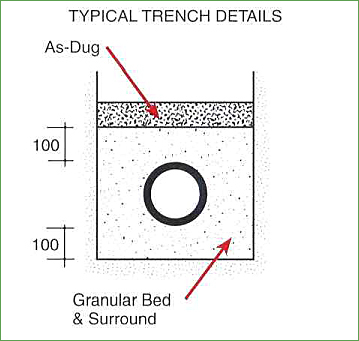 Depths of cover between which clay pipes conforming to BS EN 295 can be laid in any width of trench. Other crushing strengths may be available. For further details consult manufacturers’ sales department. 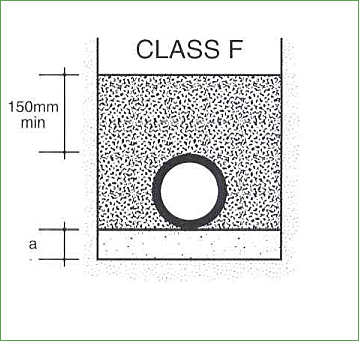 The bedding factors indicated below refer to the cross-sectional design of pipes. It assumes that uniform support is achieved along the entire length of the pipeline. 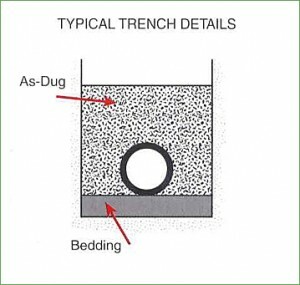 The bedding factors incorporate the revisions to Class F, B and S beddings as detailed in WRC Information & Guidance Notes 4-11-02 and are specific to the use of vitrified clay pipes. Appropriate where the highest bedding factor is required to resist the applied loads on the pipeline. 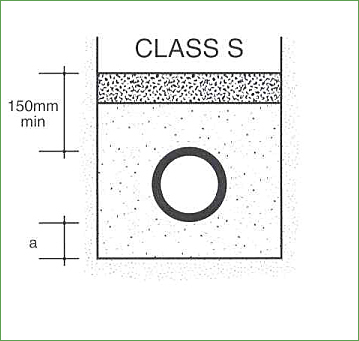 An alternative to Class B when the excavated material is unsuitable as the initial backfill. Recycled aggregates may be used for all bedding classes provided that they conform to the particle size requirements of Table B15-B17 of App B to BS EN1610 and have a compaction fraction of 0.3 or less. b) under buildings by the inclusion of additional flexible joints as illustrated. Further details are contained in the C.P.D.A. booklet “Technical Notes for Vitrified Clay Pipes”. When a line of flexibily jointed pipes is bedded, haunched or surrounded in concrete, flexibility can be maintained along its length by employing 18mm thick compressible boards at pipe joints. These should extend the full height and width of the concrete and should occur at maximum intervals of 5m along the length of the pipeline. 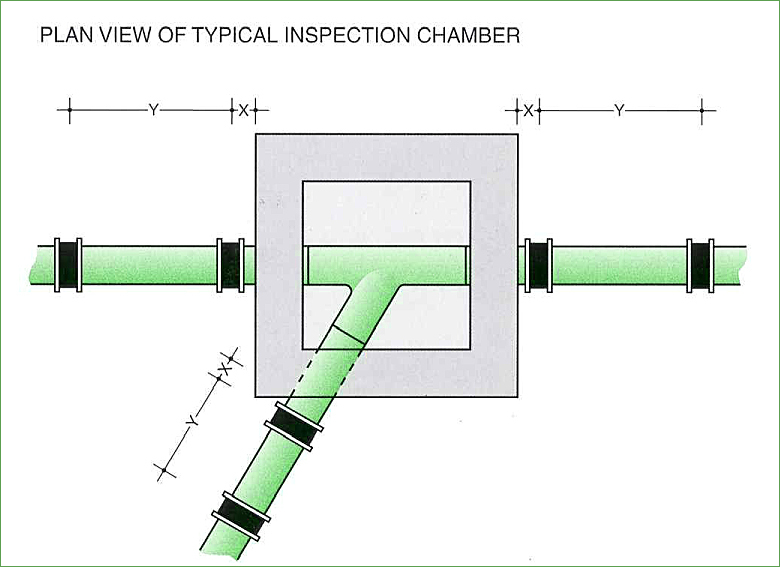 The boards should be positioned against the upstream end of pipe sockets or sleeves as shown below.